A unique combination of whole grains, millet and various other grains which are source of basic nutrients and various trace elements. Its rich in fibre and carbohydrates, contains needed essential nutrition which suits for all ages as . It is a very useful food for our daily consumption. This is one of the well-known food of traditional South India called as "sattu maavu" which is prepared at home at their convenience. Directions for use - Take 3 tsp into a bowl mix with 150ml of water , cook for 3 mts, the porridge is ready for consumption. A unique combination of whole grains, millet and various other grains which are source of basic nutrients and various trace elements. Its rich in fibre and carbohydrates, contains needed essential nutrition which suits for all ages as . It is a very useful food for our daily consumption. This is one of the well-known food of traditional South India called as "sattu maavu" which is prepared at home at their convenience. 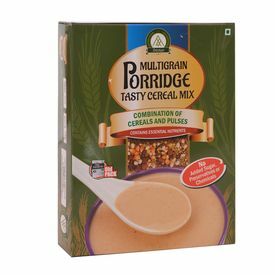 Grain based porridge with no preservatives or chemicals and no added sugar or salt Rich in fibre and carbohydrates and contains all essential nutrition Gives sustained release of energy and manages appetite for a longer duration of time Preferred to consume during breakfast time or mid morning or evening Ideal for infants from 6 months and above (Initially, start with small quantity and increase over a period of time) Suitable for pregnant women and lactating mothers also Ingredients - Cereals (66.19%) - Amaranth Seeds (Rajgira), Barley, Finger millet (ragi), Little Millet (sama), Pearl Millet (bajra), Parboiled rice, Maize, Great Millet (Jowar), Wheat . Pulses (30.22) - Chick Peas, Green Gram, Horse Gram, Roasted Gram, Soya bean. Condiments (3.6%) - Poppy seedsDirections for use - Take 3 tsp into a bowl mix with 150ml of water , cook for 3 mts, the porridge is ready for consumption.